Bearded Theory Festival announced their final headline act earlier on today. Stockport 5-piece band, Blossoms, are the last act to sign up to Bearded Theory playing the main stage. Blossoms join a wide range of artists from Jake Bugg to Sleaford Mods and Lucy Spraggan at the independently run, small scale family friendly festival. Blossoms’ first taste of mainstream success came with Charlemagne, their debut single for EMI. Released in late 2015, it went on to become Radio 1’s ‘Track of the Day’, earned them a coveted place on Spotify’s ‘Spotlight on 2016’ list, and topped the Christmas Vinyl Chart. Building on this success, they began 2016 being the only guitar band recognised on the BBC’s Sound of Music list. Later that year they went on to reach #1 in the album charts with their eponymous debut album, Blossoms, which also earned them a nomination for ‘Best British Band’ at the Brit Awards, and inclusion on the coveted shortlist for the Mercury Music Prize. 2017 saw Blossoms tour extensively across the globe, with a relentless series of high profile festival bookings including: Coachella; Radio 1’s Big Weekend; Bonnaroo; Reading/Leeds; Bestival; Benicassim, Lollapalooza, and set on Glastonbury’s iconic Pyramid Stage. They also found time to support major acts including Kasabian, Liam Gallagher, and The Stone Roses at Wembley Stadium. With rumours of new music being released in the not too distant future, 2018 is set to be another barnstorming year for the band, and we can’t wait to welcome them to headline the Pallet Stage at Bearded Theory on Friday night. 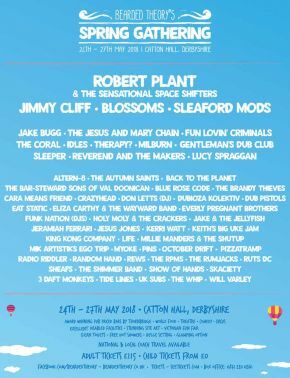 As already announced, Bearded Theory have secured a rare festival performance by Robert Plant, one of the world’s greatest rock and roll voices, to headline on Saturday. The former Led Zeppelin frontman will bring The Sensational Space Shifters, who have been selling out venues around the world, and will be performing a set full of classic hits and new material. Before recent projects in Nashville with Alison Krauss and Band of Joy, Plant worked alongside Strange Sensation, recording the critically-acclaimed Grammy-nominated albums Dreamlandand Mighty Rearranger. From this platform, Sensational Space Shifters developed. As you would expect from Bearded Theory Festival, joining Robert Plant on the bill is an exceptional and diverse collection of live acts, including Sunday headliner Jimmy Cliff, Scottish indie legends The Jesus & Mary Chain, local boy Jake Bugg, Electronic Punk Duo Sleaford Mods and English punk sensations Idles alongside classic festival acts such as Fun Lovin Criminals, The Coral, Sleeper, Dub Pistols, and hundreds more over 9 live stages. Also added to the bill is English traditional folk powerhouse Eliza Carthy who, along with the 12-strong Wayward Band, will celebrate her long and varied career in folk music within the beautiful setting of Bearded Theory’s Woodland Stage. They will be performing songs from their critically acclaimed album Big Machine (produced by Jim Sutherland) which resents a healthy slice of everything good that is happening in traditional music now, across a sparkling spectrum of sound. With Louder Than War saying of last year’s event that “Bearded Theory has grown to become one of the finest festivals the UK has to offer”, the pressure was on for 2018. However once again the organisers (and their 100% audience-focused attitude) have most certainly risen to the challenge. With more than 80% of tickets for this year’s festival already sold, 2018 is looking set to be the festival’s 9th straight sell-out year in a row. The Woodland will welcome Funhouse Comedy for the first time – they are taking over the stage daily from midnight, providing laughs aplenty well into the early hours, and have confirmed a stunning line up featuring the likes of Tom Wrigglesworth, Scott Bennett, Rob Mullholland, Sean Percival, Susan Murray, Wes Zaharuk and many more. Family camping has also once again been extended with an additional 2 fields secured, to ensure maximum comfort and enjoyment for the many thousands of families who attend the festival every year. This option should be selected at the time of ticket purchase. Tickets range from £28 to £115 for a weekend camping ticket, booking fees apply. Travel and tickets are available via www.beardedtheory.co.uk.